In a bid to save cash, get plenty of work done and detox a little we’ve retreated to Stacker’s parents’ apartment in La Chapelle d’Abondance, a tiny alpine village of the Haute Savoie. 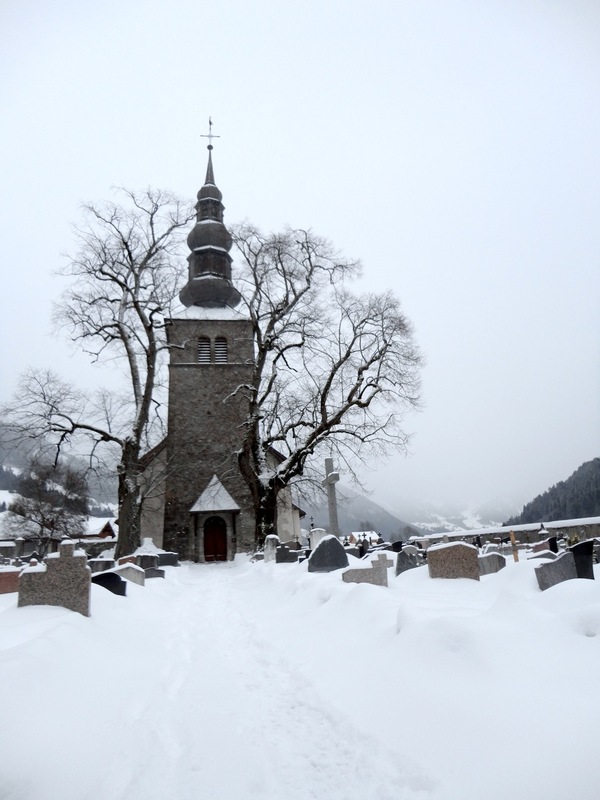 Just up the valley is the slightly better known resort of Châtel and the Swiss border is dangerously close by. Being up here is definitely a welcome break from the last few months of city slicking. The views are straight from a Swiss chocolate box, there’s more snow than our skis know what to do with and our humble little village boasts the only microbrewery (Le Fer Rouge) for miles around. After two weeks I still can’t help but smile at the sound of snow crunching underfoot. Our first two resolutions – being productive and saving cash – have been going well but the last part – detoxing – is made a little harder by the fact that the up here the food groups consist of potatoes, cheese, charcuterie (cured/dried meats) and more cheese.. with the odd egg thrown in for effect. In fact our new home-village is actually named after a rather tasty type of cheese, Abondance, which is made locally… ok, it’s probably the other way around and the cheese is named after the village but you never know! Fondue – there’s no need to make anything fancy out of all this cheese, just melt it all in a pot and dip some bread in. Croute – Bread soaked in cream and wine, topped with bacon,ham, plenty of melted cheese and an egg. Do not feed to a man or be prepared to suffer the consequences. Last but not least, the local favourite Berthoud, a bowl of the local Abondance cheese and sweet Madeira wine which is grilled until bubbly and eaten with bread like a fondue. Any self-respecting cheese lover would be in heaven but we’re trying hard to stick with the assumption that this kind of food is designed for people who’ve been out on the mountain all day, not parked in front of a computer writing code. Even while on the mountain Stacker once made the mistake of trying to stick with a ‘healthy’ option by ordering a vegetable soup. It turned up with a giant slab of cheese on the side. Oh well, time to do that mogul run again! 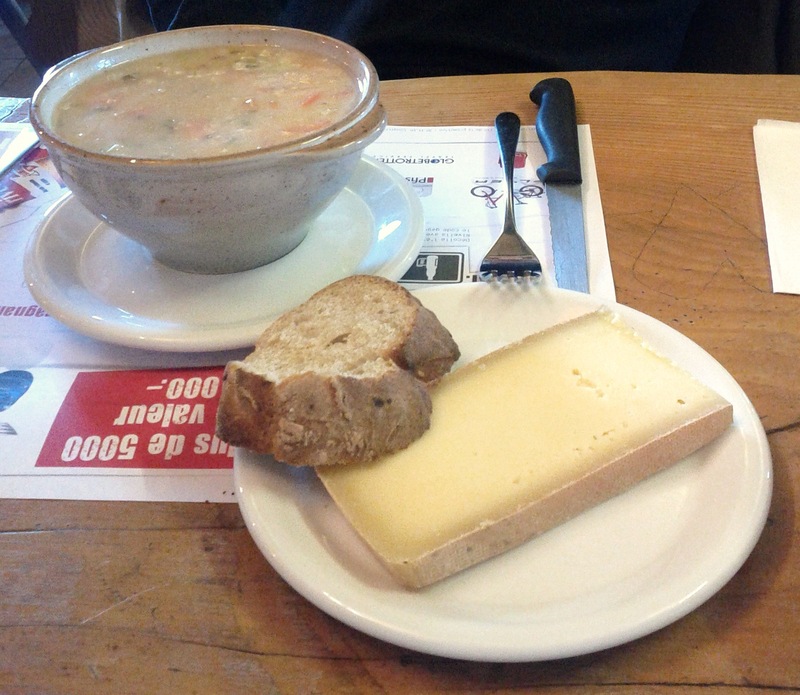 Cheese with a side of soup from Le Bourri – seriously yum! Figuring we could detox better by cooking at home, and without a car to drive to the bigger store up the valley, we headed to the small local supermarket to stock up on supplies. Unfortunately the fresh produce section consisted of a couple of wilted lettuces, bags of sprouting onions and flabby tangerines that looked like the flesh inside had long withered away. So what the hell, we figure while in Savoy, do as the Savoyard do! 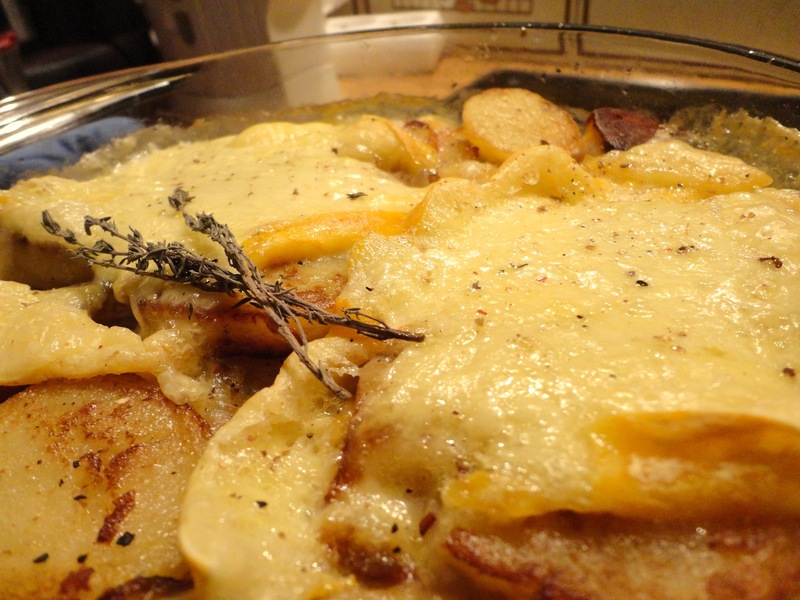 If you’d like to join us in our alpine detox, go for a long run and let’s make a tartiflette! Sorry vegetarians, this one’s not for you..
First source a Reblochon. You’re looking for a wheel of cheese that looks sort of like a jaundiced brie. Find a baking dish big enough to accommodate the Reblochon you bought and an equally-sized friend. Give the dish a rub with a smashed garlic clove. This could be more for superstitious reasons than anything else. Boil a bunch of waxy potatoes in a large pot of salty water until just about tender. Use those asbestos fingers to peel them while still warm and leave to chill out for a while. Chop a bunch of onions and fry them in butter until soft. Add a bunch of lardons (chunky bacon chopped into pieces) and fry for 2-3 minutes until they’re sealed up. Season liberally with pepper. When I say “bunch” you’ll have to decide what that means based on the size of your baking dish. Good luck. Cut the cooled potatoes into slices and, now comes the time-consuming part, fry them in batches until browned on both sides. This step is not essential but is worth it for the added texture it gives the dish. – Add a double layer of the potatoes to the base of your baking dish. – Top with a thin layer of the ‘baconion’ mixture. – Add a drizzle of double cream and a turn or two of pepper. Douse the whole thing with a liberal quantity of white wine and jiggle it up. Take the Reblochon and scrape the white residue from its outer crust with a knife – these cheeses get around and you never know where yours has been. Slice the poor thing in half along its width to make two gooey wheels. Place both wheels on top of the potatoes. Skin side down or up is your choice and a big point of contention over here. I prefer it skin down. Bang in the oven until everything is bubbly and cheese is crisping up. A good sprinkling of pepper and dried thyme never hurt anyone at this point. Pair with a Savoie white like Apremont, not exactly a Burgundy but this meal isn’t exactly cordon-bleu either. So you may have noticed this isn’t the most accurate recipe but how wrong can you really go with cheese and bacon? Now for godsake put something green on the plate with it..